An Italian favorite, rich pesto sauce is a delicious change from marinara sauces. Look for jarred pesto sauce in the refrigerated pasta section of your grocery store. Melt the butter in a large skillet over medium heat. And half and half (or cream) and pepper and cook for 5 minutes, stirring constantly. Stir in the Parmesan and pesto, stirring to combine well. Continue to stir and cook for 5 more minutes, until thick and creamy. Stir in the shrimp and continue cooking for another 6 minutes, or until the shrimp turns pink and opaque. Serve over warm pasta. Mix it up: This bright and creamy sauce tastes just as good with any seafood. 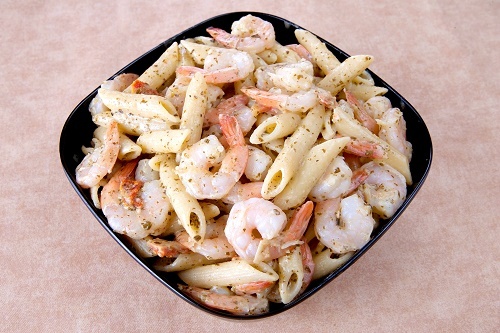 Try using crab meat, halibut filets or even swordfish steaks instead of the shrimp.